Neem flower rasam |vempam poo rasam is made in all South Indian homes on Tamil New year | Tamil varusha pirappu. I have already posted the veppam poo rasam of my mil's version few years back. Though i am not a big fan of this neem flower rasam, this version i loved it very much. I learnt this from my cousin who taught me when she visited me few months back. I have posted a garlic rasam(with coconut milk), which i learnt from her. 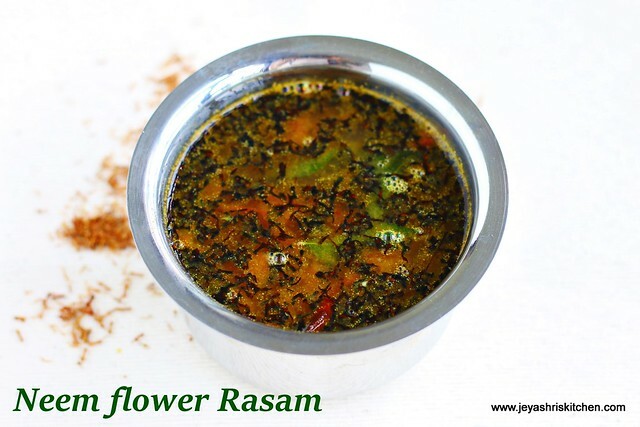 This is yet another flavourful and tasty neem flower rasam, which is her signature recipe too. 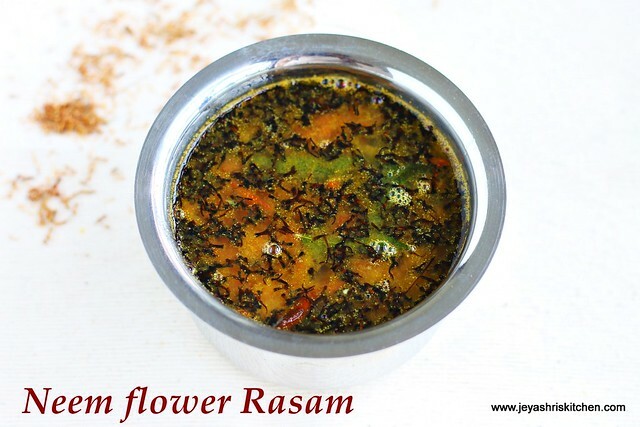 As Tamil new year is coming up in few days (April 14th), i wanted to post this recipe of neem flower rasam |vempam poo rasam. Check out my full collection of Tamil new year recipes. In a pan add oil and add in the toor dal, channa dal, red chili, slit green chili and curry leaves. Saute till the dal turns golden brown colour. Once it is done, finely chop the tomatoes and add it to the pan. Add rasam powder, turmeric powder, salt and asafoetida to this. You can add sambar powder too if you do not have rasam powder. Let this boil for 5-7 minutes till the raw smell goes. Mix the cooked toor dal with 1 and 1/2 cup water and mash well with hands. Add the toor dal water to this. Add the coconut milk too. If not adding coconut milk add 1/2 tsp of jaggery. Let the rasam froths up. Do not allow this to boil. Roast the neem flower in ghee till it turns dark brown colour. Roast in low flame as it tends to burn quite fast. Transfer this to the rasam. Neem flower rasam is ready. You can temper mustard seeds and also add coriander leaves in the last. Coconut milk gives a nice flavor to the rasam, if you have in hand add it. My cousin usually take a hand ful of coconut and grind in a mixie with little warm water and squeeze out the milk from this and add to the rasam. The coconut she adds to the curry later. Instead of toor dal water you can add moong dal water too. Wow.. this must be good foe health . seeing it for the first time.